Choosing the proper easel is one of the most important decisions an artist can face. This essential piece of equipment provides more than just a tool that holds canvases and other supports while you work; it can, depending on the easel, serve as a complete work station, as a place to display your artwork, and even as an attractive furniture addition to your living space. There are several types of easels to choose from. For those who prefer to work indoors, with large canvases, sturdy floor-standing studio easels are best. Artists who work outside and desire portability will most likely need a field or travel easel. And if space is a big issue or the artist simply prefers working on a smaller scale, table top easels provide an excellent choice. Other varieties include easels designed specifically for particular mediums like watercolor and pastel and easels made for display. Because there is such a broad variety of easels available to artists, finding the perfect easel for your studio or gallery can become a chore. Easels are typically sold in specialty art shops; in the past, finding the best deal on the perfect easel meant traveling around from store to store before lugging the new art furniture home. MisterArt.com has changed all that! Not only do we have the biggest, best selection of easels online, we guarantee to offer the lowest prices on the Internet! If we don't already offer the lowest price on easels online, we'll gladly match it! There are a lot of easels online to choose from, of course! This guide is designed to help you make a better-informed decision when it comes time to purchase the perfect easel for your needs. Often, all the artist needs is a lightweight easel to display finished artwork. Display easels are great for this purpose because they are designed to showcase the work without drawing too much attention to themselves. Display easels are not typically suited for drawing or painting purposes. Display easels are decorative, designed to prominently display paintings, photographs, maps, signs, marker boards, sketch pads, are more. Display easels and distinguished from studio easels in several ways—they are typically not as sturdy as studio easels, for example, because they aren't designed for work. They're designed to show off your artwork beautifully without distracting from it. Display easels are also less adjustable and ergonomic as their studio cousins-- they are, however, often more decorative and attractive than studio easels. Display easels are great for classes, lectures, and art shows, anywhere you need to set up a temporary presentation. Display easels are traditionally portable, but they come in a wide range of sizes and specialties. Some display easels are relatively small, designed for tabletop use. Others are quite large, designed to swivel in order to accommodate artwork and audiences of all sizes. Not all work takes place inside the artist's studio—lots of projects demand that the artist work in the field! These outdoorsy artists need easels that are light enough to carry, stable enough to withstand bumps and breezes, and adjustable for uneven terrain. They need field and travel easels! Because they're designed for portability, nearly all field and travel easels are designed to collapse or fold up for easy carrying and storage. In the interests of portability, most are constructed of light materials such as wood fiber and aluminum. There are two major styles for travel easels: tripods and box, or French, easels. Tripod easels have a simple, three-legged design that makes them ultra light and highly adjustable. They are generally made of aluminum or a light wood such as beech. Each of the three telescoping legs can be adjusted separately, making them ideal for working on rocky or uneven ground. Though unable to hold very large canvases, and not nearly as stable or durable as studio easels, tripod easels are the perfect choice for painting in open air. 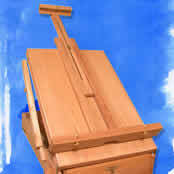 Box, or French, easels take the basic tripod design and add a compartment or "box" for holding art materials. Box/French easels often come with a work shelf and palette as well. They are as close to a traveling art studio as you can get. Of course, those are only the two most common styles of field and travel easels. Some variations include wheels and even backpack straps for easy transport! You can find the deepest discounts online on all sorts of easels every day at MisterArt.com! The youngest artists have different needs when it comes to purchasing an easel. The perfect kids' easels must be attractive, sturdy, and, above all, short! Children's easels must rise to the occasion of a multitude of art projects, often used both to create masterpieces and to display them, as well. These easels must be ergonomically designed to provide a comfortable workstation for youngsters to express themselves yet be able to withstand their more energetic efforts. Kids don't often have access to art studios, so their easels must inhabit the same spaces that children frequent. If space is scarce in the playroom, a wall easel might make the best use of a cramped art area. Tabletop easels, on the other hand, can turn the kitchen table into an art studio. For larger projects, collapsible, child-sized wooden and aluminum easels can survive anything a kid can dish out, lasting for years as a faithful art tool. No matter what style of easel best suits your favorite pint-sized Picasso's needs, you can always rely on fast shipping on name brands by shopping online with MisterArt.com! Large, heavy, and stable, studio easels provide a rock solid base for supports of all kinds. They are floor-standing and generally made of solid wood. The best studio easels are constructed with extreme care and will last for generations, but there are studio easels designed to please at any budget. The most common styles for studio easels are A-frame (or Lyre), H-frame (or Studio), and Single Mast. A-frame easels are triangular in shape with a tripod leg arrangement (two legs in front and one in back). The single rear leg makes it easy to place the A-frame easel in corners and small areas. They are more compact but generally not as stable as H-frame easels. They usually cannot accommodate the very large canvases that H-frames can and are also not as adjustable. They're perfect for the artist who wants an easel that will last but who doesn't have the space for an H-frame. H-frame easels are rectangular in shape and rest on a large rectangular base. They provide an extremely stable platform for artists to work on. H-frames can usually accommodate extremely large canvases and are often highly adjustable in terms of height and tilt angle. Many even include paint trays, becoming complete painting workstations. One disadvantage of the H-frame is that it requires a lot of space. It can also be difficult to move around because of its weight and shape. Single Masts are the most compact and affordable studio easels. They consist of a single post resting on a triangular or H-frame base. They are lighter than the other styles of studio easels and are fairly portable. Single Masts are also often highly adjustable. They make an ideal easel for students on a budget working in cramped spaces. Disadvantages of Single Masts are that they are not as stable as other studio easels and they cannot handle larger supports. Although these are the most popular styles of studio easel available, there are plenty of other options available online. Before you buy, it's always important to first measure out the space where you'd like your easel to fit. It's never fun to open the box of your brand new studio easel and assemble it only to discover it's too large! It's also a good idea to bear in mind which media you'll most often be using when working with your studio easel. Pastel artists, for example, might prefer an easel able to tilt their work forward to let pastel dust fall harmlessly to the floor. Oil painters might need an easel able to accommodate extra-large canvases. Examining what you expect out of an easel is an important step in finding the perfect match for your budget. Don't forget, MisterArt.com's VIP members save up to 60 percent off on studio easels every day! Small enough to be set on a table or desk, table top easels are great for artists with extremely small work spaces or who simply prefer to sit while they work. While excellent for working in small scale, table top easels are unable to hold large canvases. They are also not the best choice for working outside, as they need a flat surface to rest on. Despite their smaller scale, you can find many of the same qualities in table top easels as you might in a larger studio easel. A-frame, H-frame, single-mast, and even box easels are available online, scaled down to size in order to rest comfortable on any flat work surface. Most table top easels are constructed from aluminum or wood to ensure that they're both sturdy and portable. Whether it's your desk at school or your kitchen table you're turning into a studio, you'll find the best prices online at MisterArt.com! Single mast are the most compact and affordable studio easels. They consist of a single post resting on a triangular or H-frame base. They are lighter than the other styles of studio easels and are fairly portable. Single Masts are also often highly adjustable. They make an ideal easel for students on a budget working in cramped spaces. Disadvantages of Single Masts are that they are not as stable as other studio easels and they cannot handle larger supports. Table Top easels are great for artists with extremely small work spaces or who simply prefer to sit while they work. While excellent for working in small scale, table top easels are unable to hold large canvases. They are also not the best choice for working outside, as they need a flat surface to rest on. A thoughtful addition to any studio.